Are you interested in using argument-driven inquiry for middle school lab instruction but just aren’t sure how to do it? 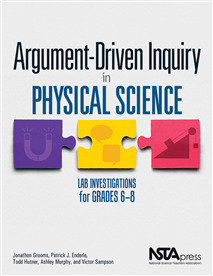 Argument-Driven Inquiry in Physical Science will provide you with both the information and instructional materials you need to start using this method right away. The book is a one-stop source of expertise, advice, and investigations to help physical science students work the way scientists do. 2. A well-organized series of 22 field-tested labs designed to be much more authentic for instruction than traditional laboratory activities. The labs cover four core ideas in physical science: matter, motion and forces, energy, and waves. Students dig into important content and learn scientific practices as they figure out everything from how thermal energy works to what could make an action figure jump higher. The authors are veteran teachers who know your time constraints, so they designed the book with easy-to-use reproducible student pages, teacher notes, and checkout questions. The labs also support today’s standards and will help your students learn the core ideas, crosscutting concepts, and scientific practices found in the Next Generation Science Standards. In addition, the authors offer ways for students to develop the disciplinary skills outlined in the Common Core State Standards. Many of today’s middle school teachers—like you—want to find new ways to engage students in scientific practices and help students learn more from lab activities. Argument-Driven Inquiry in Physical Science does all of this while also giving students the chance to practice reading, writing, speaking, and using math in the context of science. My students found several of these to be very intellectually challenging...yet they had fun and improved as the lab progressed.